We introduce the Free Music Archive (FMA), an open and easily accessible dataset suitable for evaluating several tasks in MIR, a field concerned with browsing, searching, and organizing large music collections. To date, the best performing techniques, such as the pYIN algorithm, are based on a combination of DSP pipelines and heuristics. Following their success in Computer Vision and other areas, deep learning techniques have recently become widely adopted in Music Information Retrieval (MIR) research. This data set is the first publicly available set in OMR research with sufficient size to train and evaluate deep learning models. 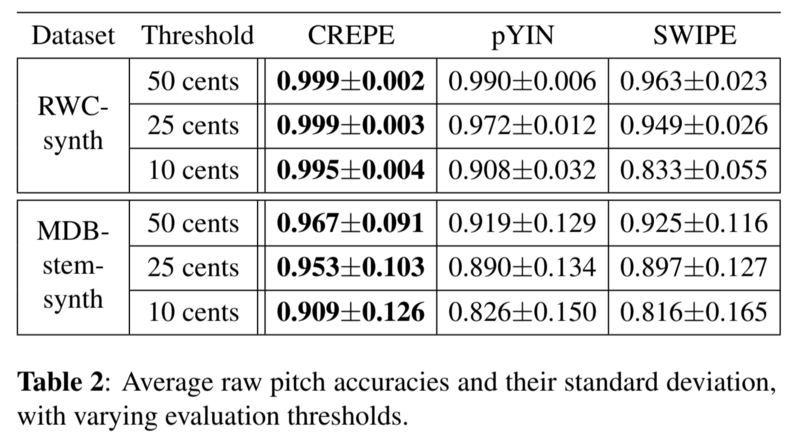 To this end, an established classification architecture, a Convolutional Recurrent Neural Network (CRNN), is applied to the artist20 music artist identification dataset under a comprehensive set of conditions. We present a unique neural network approach inspired by a technique that has revolutionized the field of vision: pixel-wise image classification, which we combine with cross entropy loss and pretraining of the CNN as an autoencoder on singing voice spectrograms. Based on this, we introduce a method for descriptor-based synthesis and show that we can control the descriptors of an instrument while keeping its timbre structure. Feature learning and deep learning have drawn great attention in recent years as a way of transforming input data into more effective representations using learning algorithms. Recognizing Musical Entities is important for Music Information Retrieval (MIR) since it can improve the performance of several tasks such as music recommendation, genre classification or artist similarity.